The Suncoast Sand Fleas is a welcoming & very active Meetup Group! SING ‘n’ STRUM ALONG – A Ukulele Meetup each month at The Ukulele Place at The Rhythm Inlet. Everyone’s welcome, all levels of players, beginners to professional, & friends to listen & groove! 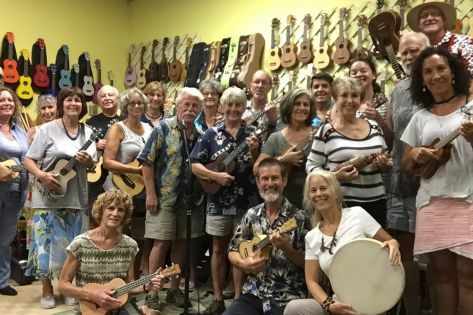 Come strum, sing, toe tap, percuss, or simply relax & enjoy the music & merriment of some friendly folks. We use The Daily Ukulele books — both the yellow one & the blue one — by Liz & Jim Beloff, available on Amazon. Don’t have copies yet? No problem! We’re always happy to share. And some members bring plenty of copies of music when they’d like to lead the group in a song not in the books. SOCIAL – Several of us go out for food & drink in the ‘hood afterwards. You’re invited! * Visit or join the Sand Fleas on Meetup for all upcoming events announcements. * Visit or join the Sand Fleas on Facebook for sharing & viewing fun posts (& some events, too, but those sometimes get lost in all the other posts).